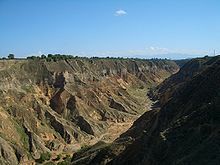 The area is named for its most distinctive feature, the highly friable "loess" (German for "loose"; Chinese: 黃土, huángtǔ, "yellow earth") soil that has been deposited by wind storms over the ages. Historically the Loess Plateau has provided simple, insulated shelter from the cold winter and hot summer in the region, as homes called yaodong (窰洞) were often carved into the loess soil. In medieval times people stayed here to grow rice; some families still live in this kind of shelter in modern times. In ancient times, this region was an important center of the Silk Road. Goods moving by caravan to the west included gold, rubies, jade, textiles, coral, ivory, and art works. In the opposite direction moved bronze weapons, furs, ceramics, and cinnamon bark. During the 1556 Shaanxi earthquake, 830,000 people were killed as a result of collapsing loess caves. The yaodongs that are best known to the world are perhaps those in Yan'an where the Communist Party led by Mao Zedong headquartered in 1930s. When Edgar Snow, the author of Red Star Over China, visited Mao and his party, he lived in a yaodong. The plateau generally has a semi-arid climate (Köppen BS), with extensive monsoonal influence. Winters are cold and dry, while summers are very warm and in many places hot. Rainfall tends to be heavily concentrated in summer, and the area receives extensive amounts of sunshine. Land degradation results in canyons like this one that cuts the loess plateau in Linxia County, Gansu. Reduced moisture suction due to a degraded vegetation layer formed this creek flowing into the lower Daxia River. 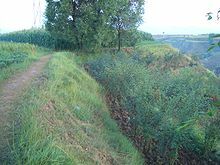 The Loess Plateau was highly fertile and easy to farm in ancient times, which contributed to the development of early Chinese civilization around the Loess Plateau. Centuries of deforestation and over-grazing, exacerbated by China's population increase, have resulted in degenerated ecosystems, desertification, and poor local economies. In 1994 an effort known as the Loess Plateau Watershed Rehabilitation Project was launched to mitigate desertification; limited success has resulted for a portion of the Loess Plateau, where now trees and grass have turned green. A major focus of the Project was to try to guide the people living in the Plateau to use more sustainable ways of living such as keeping goats in pens not being allowed to roam free and erode the soft silty soil found in the plateau. Many trees were planted and nature is now reclaiming a portion of the Loess Plateau. Restoration has occurred over an area of about 35,000 square kilometers (about 5% of the plateau's total area). Results have reduced the massive silt loads to the Yellow River by about one percent. 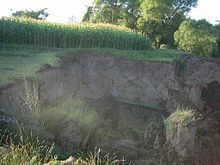 The Loess Plateau was formed over long geologic times, and scientists have derived valuable information about global climate change from samples taken from the deep layer of its silty soil. ^ a b Scheffel, Richard L.; Wernet, Susan J., eds. (1980). Natural Wonders of the World. United States of America: Reader's Digest Association, Inc. p. 341. ISBN 0-89577-087-3.